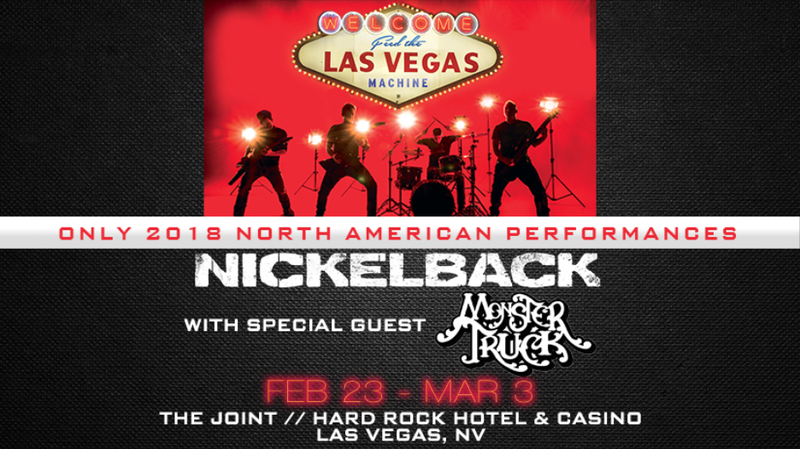 After a nearly seven-year absence from Las Vegas, multi-platinum, chart-topping rock band, Nickelback, is returning to Sin City for an impressive five-night run at The Joint at Hard Rock Hotel & Casino. Monster Truck will open all five shows. The limited run is made even more special with the announcement that these shows will be the only North American dates scheduled in 2018. Nickelback released their highly anticipated ninth studio album Feed The Machine, which debuted in the Top 5 on the Billboard charts and recently completed a packed 45-city tour this past summer. Following their Vegas run, Nickelback will embark on the International leg of the 'Feed The Machine Tour' throughout the remainder of 2018 (dates to be announced soon). The Las Vegas shows are scheduled for February 23, 24, 27 and March 2 and 3, 2018. Tickets go on sale to the public on Friday, November 10 at 10 a.m. PT. Tickets for the Feed The Machine Las Vegas residency start at $50.50 (plus applicable service fees), and will be available beginning with a fan club pre-sale here on Tuesday, November 7 at 10:00 a.m. PT. American Express® Card Members can purchase tickets before the general public beginning Wednesday, November 8 at 10 a.m. PT. Public on-sale begins Friday, November 10 at 10 a.m. PT at the Hard Rock Hotel box office in Las Vegas, by calling 888.9.AXS.TIX or online at www.axs.com. Nickelback will offer a limited number of VIP packages for each show with options that include one-night accommodations at the Hard Rock Hotel, premium seating, early entry and an exclusive pre-show VIP Rockstar lounge with food, drinks and more, a specially designed Nickelback messenger bag, limited edition guitar pick set in wood casing, VIP laminate and commemorative VIP ticket and more. Fans can click here for more info. VIP Packages will be made available during the presale.